Another outcome of my visit to Ennerdale Water a couple of weeks ago in July (see “Life in the Deep Zone”) was some tiny green spheres in the sample I collected from one of the small streams flowing into the lake’s north-west corner. The stream was very short, little more than a seepage arising from a wet rush-dominated area of a field just twenty metres or so from the lake margin and, at the point which I sampled, there was a tangle of filamentous algae (Stigeoclonium, Mirsrospora and Mougeotia) as well as a distinct diatom-dominated film on exposed stones. The colonies looked like tiny peas in my sample tray but I suspect that they were attached to rocks or aquatic vegetation before I disrupted them. Under the microscope, these turned out to be colonies of the green alga Chaetophora pisiformis, a relative of Draparnaldia and Stigeoclonium, both of which I have written about before (see “The exception that proves the rule …” and “A day out in Weardale …”. Like those, Chaetophora has branched filaments but they differ in forming well-defined colonies that are visible to the naked eye. The pictures below show the form of colonies very clearly. Chaetophora colonies are firm to the touch and cannot easily be squashed under a coverslip. I overcame this by using a cavity slide, and taking one of the smallest colonies that I could find in order to photograph it with as little damage as possible. Note how there is a very clear edge to the colony, whereas Draparnaldia and Stigeoclonium have a mass of filaments and mucilage but no obvious border between the “colony” and the surrounding environment. Draparnaldia sometimes forms discrete colonies (see “The exception that proves the rule …”) but these are much softer and more easily squashed onto a slide. 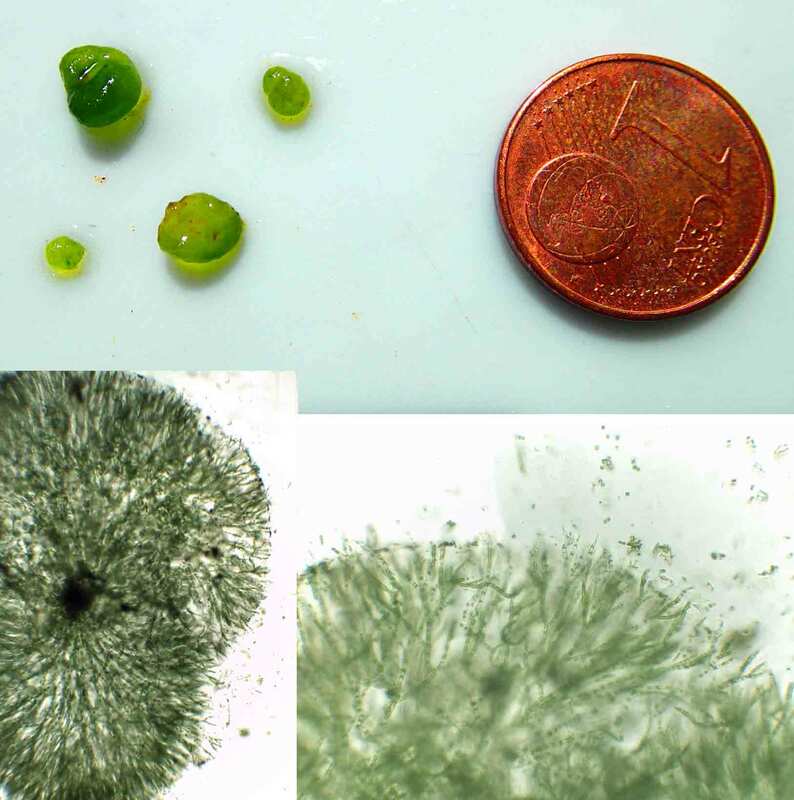 Top: colonies of Chaetophora pisiformis from a small stream flowing into Ennerdale Water, with a one cent coin for scale; bottom left: lower power (x40) view of a colony. The picture frame is about two millimetres across; bottom right: medium power (x100) view of the same colony. Viewed at higher magnifications, the branches of the filaments are clear. They tend to be clustered towards the tops of the filaments and, in this case at least, end abruptly, rather than tapering to fine hairs. I explained in the posts mentioned above how these fine hairs are used by the algae as means of capturing the nutrients that they need. Chaetophora can form these hairs, but it does so less often, in my experience, than Draparnaldia and Stigeoclonium. There will be dead and decaying vegetation in the rush-dominated swamp from which the stream originates, and the enzymes that these algae produce will be able to harvest any phosphorus from organic particles that result from this decay. That’s the theory for Stigeoclonium at least, but I suspect that the colonies of Chaetophora are also highly efficient recycling units: the filaments are embedded in a firm mucilage that is far more than an inert polysaccharide gunk. Any phosphorus that is released from a filament will be far more likely to be hoovered up by another filament than to drift downstream whilst the phosphatase enzymes will also be on hand at the colony surface to savenge any stray nutrients from the seepage. These tight colonial forms are, in other words, fortresses of plenty in an otherwise inhospitable landscape: well adapted to nutrient-stressed situations and, as a paucity of nutrients is the natural condition of streams, the presence of these colonies is a good sign that this stream is in good condition. Filaments of Chaetophora pisiformis from a small stream flowing into Ennerdale Water, July 2018. Scale bar: 20 micrometres (= 1/50th of a millimetre). Whitton, B.A. (1988). 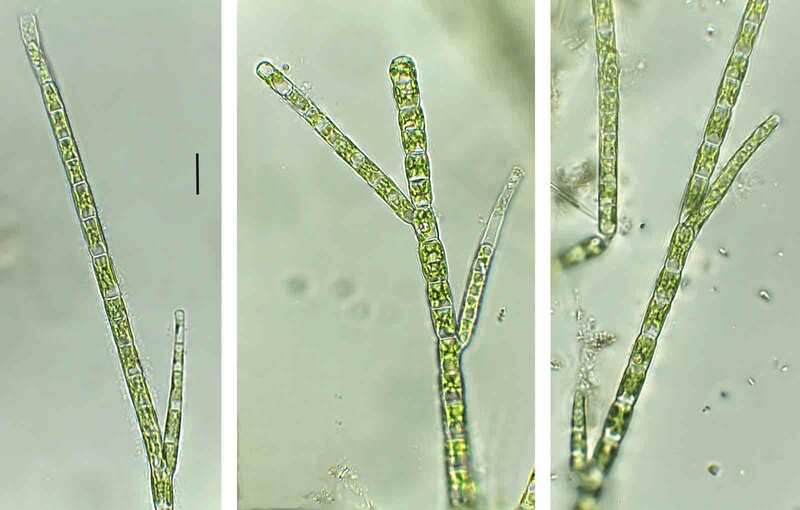 Hairs in eukaryotic algae. pp. 446-480. In: Algae and the Aquatic Environment (edited by F.E. Round). Biopress, Bristol. As my last post used the conventions of figurative art to describe algal ecology, I thought I would stick to graphs – science’s very own school of abstract art – for this one. I spent some time in “Small details in the big picture” discussing the ecology of Platessa oblongella (including P. saxonica) but without saying very much about the types of streams where these species were found. So I am going to take a step away from the Ennerdale catchment in this post and, instead, collate environmental data a large number of sites to get a broader understanding of their habitat preferences. 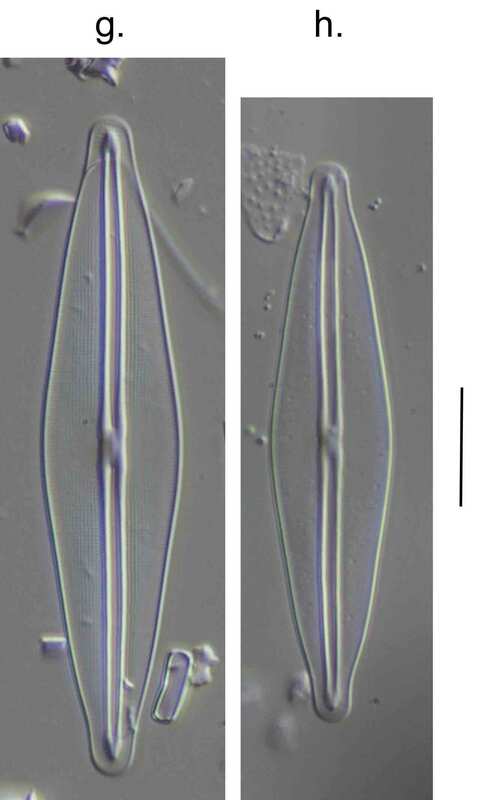 As these species are often associated with Odontidium mesodon (see “A tale of two diatoms …”), I will summarise the preferences of this species at the same time (but see Annex 1 for a graph of this species’ preferences for still versus standing water). 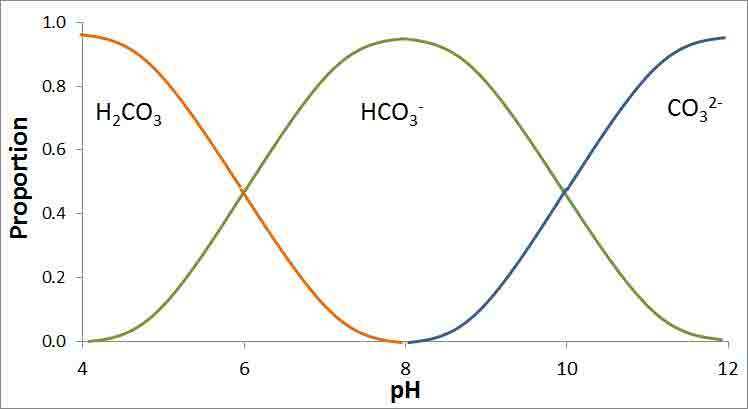 The first set of graphs show the response of these species to pH and alkalinity and establish both as species typical of circumneutral soft water. Platessa oblongella can be abundant in more acid conditions (i.e. to the left of the green vertical lines) but most of the records where it is abundant have pH values between 6.5 and 7.5. Note that P. oblongella can also be found in humic waters, where lower pH thresholds apply (see Annex 2). 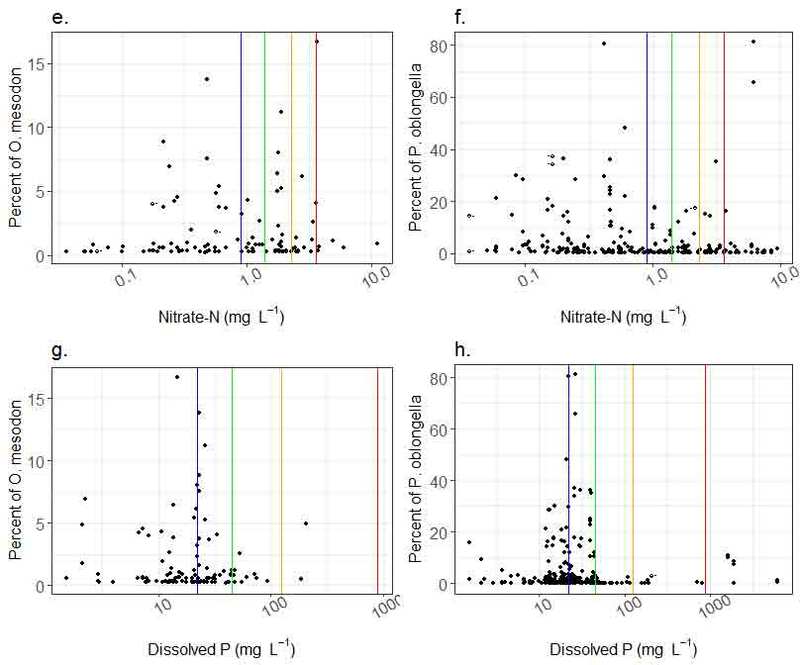 Distribution of Odontidium mesodon and Platessa oblongella (including P. saxonica) to pH and alkalinity in UK streams. Vertical lines for pH indicate threshold values that should support high (blue), good (green), moderate (orange) and poor (red) ecological status classes. See Annex 2 for more explanation. The second set of graphs shows how these species respond to inorganic nutrients. Both are most abundant when inorganic nutrients are present in low concentrations, though the trend is stronger for phosphorus than it is for nitrate-nitrogen. The graphs for Platessa oblongella, however, both have a few outliers. I have seen P. oblongella in a few situations where I did not expect it – I remember finding it in the Halebourne, a stream draining heathland around Aldershot and Bagshot in Surrey, where the water was well buffered (mean alkalinity: 61.3 mg L-1 CaCO3) and nutrient concentration were high (mean total oxidised nitrogen: 4.01 mg L-1; dissolved phosphorus: 0.25 mg L-1) and Carlos Wetzel and colleagues note some other anomalous records from the literature in their paper (cited in my earlier post), including a few from high conductivity and even brackish environments. So we should treat these plots as indicative of the ecological preferences rather than definitive. Distribution of Odontidium mesodon and Platessa oblongella (including P. saxonica) to nitrate-N and dissolved phosphorus in UK streams. Vertical lines indicate threshold values that should support high (blue), good (green), moderate (orange) and poor (red) ecological status classes. See Annex 2 for more explanation. Distribution of Odontidium mesodon (i.) and Platessa oblongella (j., including P. saxonica). The solid lines represent relative sampling effort (i.e. the proportion of samples in the dataset collected in a particular month) and the vertical bars represent samples where the relative abundance of taxon in question exceeded the 90th percentile for that taxon (20% for P. oblongella/P. saxonica and 5% for O. mesodon). Kelly, M.G., Juggins, S., Guthrie, R., Pritchard, S., Jamieson, B.J., Rippey, B, Hirst, H & Yallop, M.L. (2008). Assessment of ecological status in UK rivers using diatoms. Freshwater Biology 53: 403-422. As I included a graph showing the preference of Platessa oblongella / P. saxonica for still or standing water in “A tale of two diatoms …”, I have included a similar graph for Odontidium mesodon here. I have not included any data from the streams that flow into Ennerdale Water’s north-west corner in this graph as this would give a distorted picture. To date, I have only seen a single valve of O. mesodon during analyses of 14 samples from these streams but I have not yet sampled these in spring which, as the graph above shows, is the time when O. mesodon is most abundant. Like Platessa oblongella, O. mesodon is predominately a species of running, rather than standing waters. 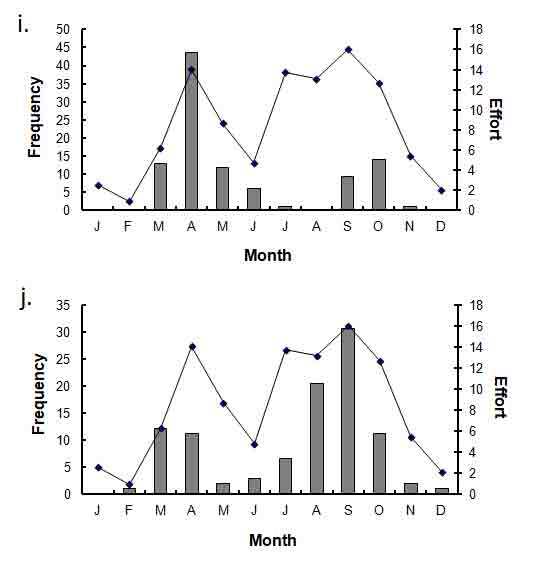 Differences in percentage of Odontidium mesodon in epilithic samples from Ennerdale Water and associated streams. Data collected between 2012 and 2018. These are based on interrogation of a database of 6500 river samples collected as part of DARES project. Vertical lines show UK environmental standards for conditions necessary to support good ecological status: blue = high status; green = good status, orange = moderate status and red = poor status. 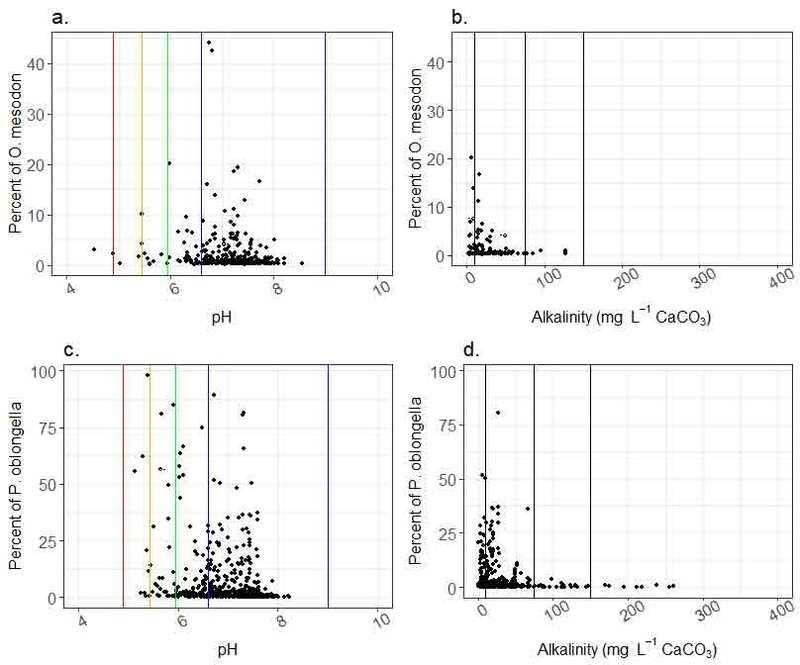 Note that there are no environmental standards for alkalinity and the vertical lines show a rough split of the gradient into low alkalinity (“soft water”: < 10 mg L-1 CaCO3), low/moderate alkalinity (³ 10, < 75 mg L-1 CaCO3), moderate/high alkalinity (³ 75, < 150 mg L-1 CaCO3) and high alkalinity (“hard water”: ³ 150 mg L-1 CaCO3). pH thresholds are for clear water (see UK TAG’s Acidification Environmental Standards. The corresponding thresholds for humic waters are lower (high/good: 5.1; good/moderate: 4.55; moderate/poor: 4.22; poor/bad: 4.03). Phosphorus thresholds are based on UK TAG’s A Revised Approach to Setting WFD Phosphorus Standards. Current UK phosphorus standards are site specific, using altitude and alkalinity as predictors. This means that a range of thresholds applies, depending upon the geological preferences of the species in question. The plots here show the position of boundaries based on the average alkalinity and altitude measurements in the DARES database. Note, too, that phosphorus analyses use the Environment Agency’s standard measure, which is unfiltered molybdate reactive phosphorus. This approximates to “soluble reactive phosphorus” or “phosphorus as orthophosphate” in most circumstances but the reagents will react with phosphorus attached to particles that would have been removed by membrane filtration. I’ve written about Platessa oblongella, a small diatom common in low alkalinity environments, before (see “A tale of two diatoms …” and links therein) but my travels around west Cumbria are gradually revealing more and more about the ecology of this organism, so bear with me as I explain my latest findings. 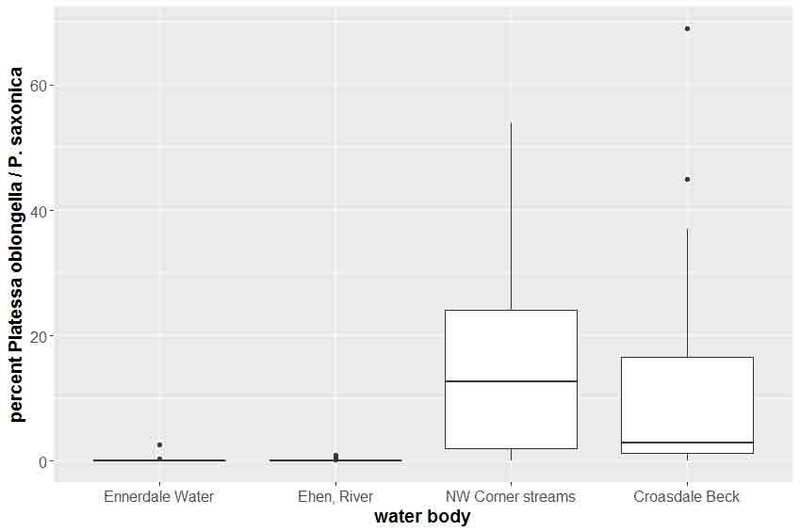 My first graph shows how the distribution of this diatom varies in different types of water body in the Ennerdale catchment. I have analysed 223 samples from this small area over the past few years and, within this dataset, there is a very clear distinction between situations where Platessa oblongella is abundant and situations where it is very rare. 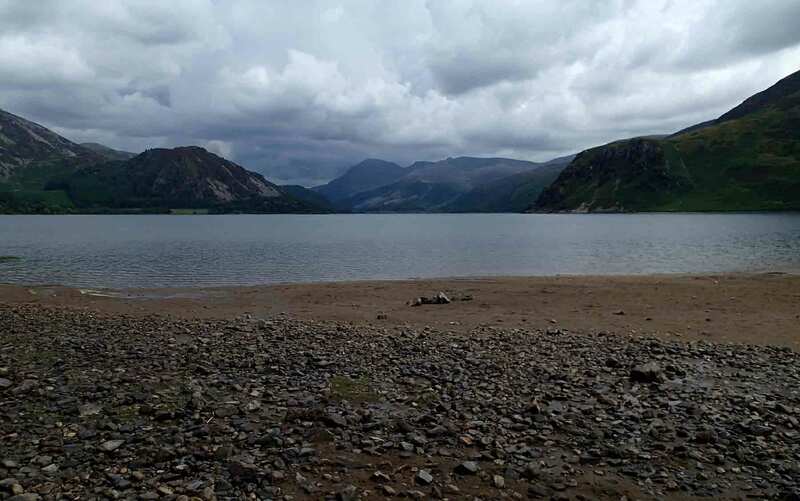 I have very few records from Ennerdale Water itself (present in just two out of 27 samples, and never comprising more than 2.7% of all diatoms in the sample) nor from the River Ehen, which flows out of the lake (present in just 16 out of 164 samples, and always £ 1% of all diatoms). By contrast, in Croasdale Beck and in streams that flow into the north-west corner of the lake, it is present in 28 out of 32 samples, with a maximum relative abundance of 69%. In ten samples it forms more than 10% of all diatoms present. Several of my samples from the small streams were collected from just a few metres above the point where they joined the lake, which makes the distinction between these streams and the lake that much more intriguing. 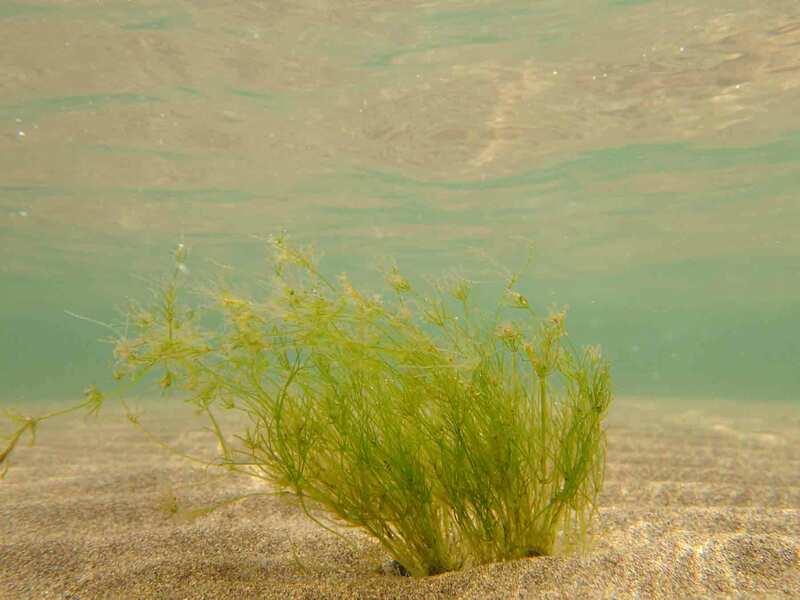 My theory – based on data I showed in A tale of two diatoms is that Platessa oblongella is a species of disturbed habitats and that the littoral zone of a lake, whilst subject to some turbulence, is less disturbed than the rough world of an unregulated stream. The contrast between the River Ehen immediately below the dam at the outfall of the lake and the various small tributary streams also supports this idea. 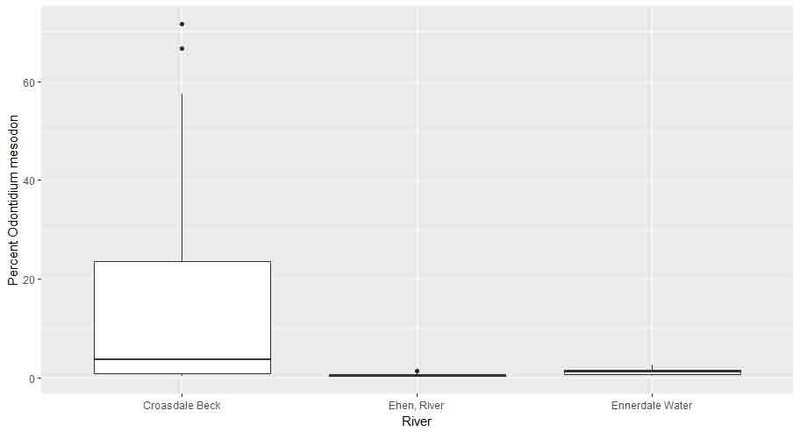 Differences in percentage of Platessa oblongella (including P. saxonica) in epilithic samples from Ennerdale Water and associated streams. Data collected between 2012 and 2018 (along with one sample from River Ehen collected in 1997). The photograph at the top of the post shows Ennerdale Water, photographed in January 2018. Some of the populations I looked at seemed to consist of two distinct forms, one broader than the other. This variability is quite common in Platessa oblongella and Carlos Wetzel and colleagues recently published a paper which suggests that these are, in fact, two distinct species. 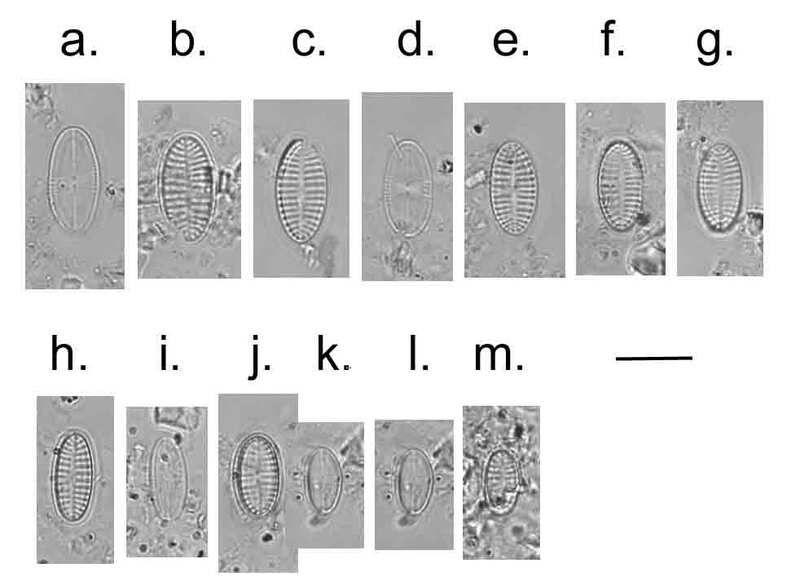 When I first started looking at diatoms, John Carter, my mentor, used the name Achnanthes saxonica, but Krammer and Lange-Bertalot, in the revised Süsswassserflora, regarded this as a synonym of Achnanthes oblongella, a species first found in Thailand. Wetzel’s study shows, as well as the difference in valve width, differences in the fine details of the striae between the two species. They also decided that both species belonged in the genus Platessa, rather than Achnanthes. Platessa oblongella (top) and P. saxonica (bottom) from Croasdale Beck, October 2017. Scale bar: 10 micrometres (= 1/100th of a millimetre). Valve width is, however, a very useful criterion, as the histograms below show. The left hand graph shows a distinctly bimodal distribution of widths in specimens from Croasdale Beck, whilst the right hand graph shows a much tighter, and clearly unimodal, range. This comes from another tributary stream flowing into the Ehen about 500 metres below the lake itself. Quite why two species can co-exist in one stream but only one is present in another is not clear. 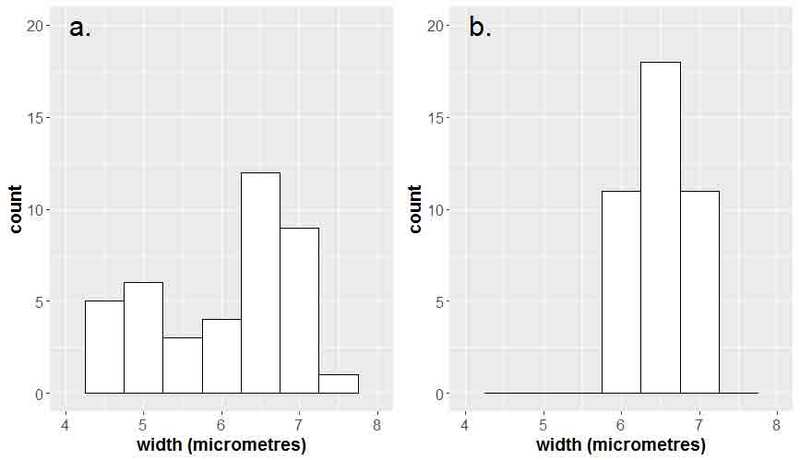 The modes of these populations are very close to the median widths for P. saxonica (narrow, ± 4/5 – 5 mm) and P. oblongella (broader, ± 6.5 mm) respectively but, as the left hand histogram shows, there is some overlap. You might have trouble, for example, deciding whether a valve that was 5.5 mm wide was a “fat” P. saxonica or a “thin” P. oblongella. My standard advice in situations such as this is that we should identify populations not individuals although, in the case of Croasdale Beck, this will still leave a grey area between the “fat” and “thin” valves where a judgement call is necessary. In this case I think I could have done it because the P. saxonica valves in this stream tended to have a greater length:breadth ratio than those of P. oblongella, though I have not actually quantified this. Width of valves in populations of “Achnanthes oblongella” from a) Croasdale Beck, and b) an unnamed tributary stream of the River Ehen, October 2017. There is more to say about the ecology of these species, but I have probably written enough for now. I will leave you, for now, to bask in the rare sensation that occurs when diatom taxonomists make a situation clearer rather than more opaque, and return to this subject in a future post. Carter, J.R. (1970). Observations of some British forms of Achnanthes saxonica Krasske. Microscopy: Journal of the Quekett Microscopical Club 31: 313-316. Wetzel, C.E., Lange-Bertalot, H. & Ector, L. (2017). Type analysis of Achnanthes oblongella Østup and resurrection of Achnanthes saxonica Krasske (Bacillariophyta). Nova Hedwigia, Beiheft 146: 209-227. In Ecology in the hard rock café I wrote about the challenges of living in an aquatic world where carbon – one of the raw materials for photosynthesis – was in short supply. What I did not write about in that post is that this carbon also gives freshwater some useful additional properties. In brief, rainwater is not pure water, but absorbs carbon dioxide from the atmosphere. This, in turn, makes rainwater slightly acidic and, when it falls onto rocks, this weak acid dissolves the minerals from which the rock is made. This adds two other forms of carbon to the water – bicarbonate and carbonate (the latter, particularly, from limestone). Each of these three types of carbon in freshwater can convert to either of the other two types, with the speed of the reaction depending on the balance between the forms (the “law of mass actions”). In essence, the reactions proceed until equilibrium is obtained, and this equilibrium, in turn, depends upon the pH of the solution. These processes are summarised in the diagram below. Relationship between pH and the proportion of inorganic carbon as free carbon dioxide (or carbonic acid, H2CO3 – orange line), bicarbonate (HCO3– – green line) and carbonate (CO32- – blue line). The chemistry behind this is not easy to explain but a consequence is that any attempt to shift the pH (e.g. by adding acid) causes an automatic adjustment in the balance between the different forms of carbon. Some of the hydrogen ions that could make the water acid are, instead , bound up as bicarbonate, and the pH, as a result, does not change. The greater the quantity of inorganic carbon in the sample, in other words, the greater the capacity of the water to resist changes in pH. The carbonate, bicarbonate and free carbon dioxide together act as a “buffer”, a chemical shock absorber. Think of it as equivalent to the responsible use of a credit card or savings account to defer the cost of an unexpected bill (a car repair, for example) so that your current account does not go overdrawn. Because life largely evolved in well-buffered marine systems, the enzymes that run our cells generally work best within a narrow range of pH (approximately 6-9). Cells – unicellular life forms in particular – get stressed if pH strays outside this range, so the greater the buffering capacity, the easier it is for cells (life at high pH can bring additional complications, but we don’t have time to go into those here). “Alkalinity”, as I mentioned in the earlier post, is the measure that ecologists use to assess the strength of the buffer system in a lake or river. The principle of the measurement is straightforward: we add a dilute acid very slowly and watch what happens to the pH. At first, nothing happens but, as soon as the water’s natural buffering capacity has been exceeded, pH drops rapidly. 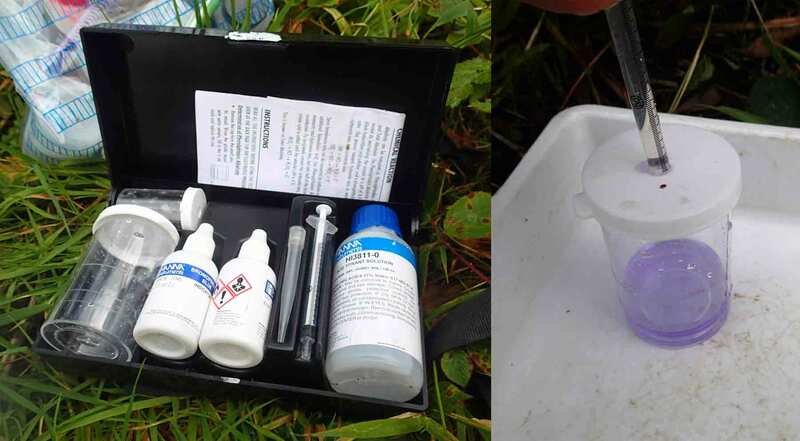 I have a small portable alkalinity titration kit which involves adding drops of bromophenol blue indicator to a sample of stream or lake water. This gives the water a blue colour when the pH is greater than 4.6. As the pH falls, the solution becomes colourless and, eventually, turns yellow. If you look at the graph above you will see that, at pH 4.6 most of the bicarbonate (HCO3–) has been converted to carbon dioxide so the buffering capacity is pretty much non-existent. This means that I can use the quantity of acid that is needed to make the bromophenol blue change colour as a measure of the buffering capacity of the water. Alkalinity titrations beside Ennerdale Water (see top photograph) using a Hanna HI 3811 alkalinity test kit. The right hand image shows acid being added to the water sample with a 1 ml pipette. The blue colour shows that pH has not yet dropped below 4.6. All this talk of chemical equilibria seems to be a long way from the natural history that is the core business of this blog. Yet, at the same time, these reactions describe natural phenomena every bit as real as the plants and animals that attract the interest of naturalists. Geology and chemistry ultimately create the context within which biology flourishes, but it is rare to meet a chemist who can talk with a naturalist’s passion. I think that this is partly because chemistry tends not to describe tangible features of the landscape but, instead, quickly gets lost in abstract equations. However, it is also a matter of culture: chemists need clinical separation from the mud and filth to maximise precision, whilst ecologists feel the lure of the field. There is, nonetheless, a very basic and necessary link between the chemistry and ecology of aquatic systems. Geology may shape a landscape but chemistry is one of the key mediators that determines the types of plants that cloak the hills and vales. We ignore it at our peril. In my first post of 2017, I wrote “I fear, microscopic benthic algae may be ecology’s Sirens, sitting on submerged rocks and luring the unsuspecting into a world of taxonomic detail that is too rarely accompanied by profound ecological insight” (see “Not so bleak midwinter?”). That was a post about Ennerdale Water and the River Ehen and I return to that same remote and beautiful part of north-west England to put some flesh onto the bones of that statement. 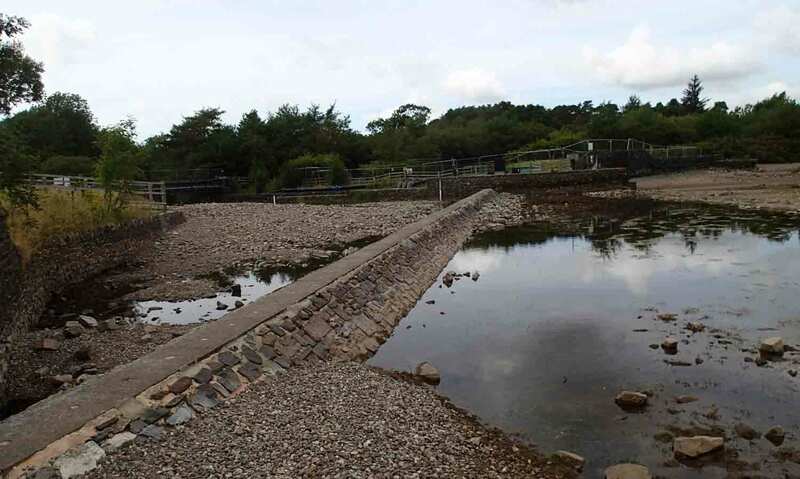 I chose a slide Ennerdale Water for the latest “ring test” which tests the competence of the analysts involved in routine ecological assessments using diatoms. Everyone analyses the same slide and sends their results to me and I sort through and note areas of disagreement. In this case, there was quite a lot of disagreement even amongst the experienced analysts but, as if to prove the point in my opening paragraph, this did had only a small effect on the conclusions that people reached on the quality of the ecosystem that the sample represented. One of the areas of disagreement was a population of Brachysira that some described as Brachysira brebissonii whilst others suggested it was B. intermedia. My inclination, following the illustrations in Hofmann et al’s Diatomeen im Süsswassser-Benthos von Mitteleuropa, was to call it B. intermedia as the illustrations of B. brebissonii show more broadly-rounded ends than were apparent in the Ennerdale population. However, Bryan Kennedy, a member of our scheme, has been looking into the taxonomy of this genus as part of his PhD and directed me towards a paper by Bart van der Vijver, in which he had examined the type material for B. brebissonii (as “Navicula brebissonii Brébisson). His illustrations show a population with more acute ends than Hofmann et al.’s illustrations. Its shape is, in fact, much closer to that of the examples of B. intermedia that they illustrate. Yet, we were all agreed, this taxonomic ambiguity had little effect on the interpretation that an ecologist would reach. Most Brachysira species (with the curious exception of the type species, B. aponina) are associated with circumneutral to slightly acid water and low nutrients. The species of the genus vary in their preference for alkalinity and hardness but, generally, indicate high quality conditions. Another of the species present in the same sample was Frustulia crassinervia, which presents an interesting counterpoint to the situation I described for Brachysira brebissonii. In this case, there was another possible candidate, Frustulia saxonica and, in fact, the rhombic-lanceolate outline of the Ennerdale Water population did suggest this species. However, the clearly protracted ends and the size are more characteristic of F. crassinervia which was the name that the majority of experienced analysts opted for. Once again, however, both species have similar ecological requirements: soft, often peaty water with low levels of enrichment. Frustulia crassinervia from the south-east end of Ennerdale Water (circa NY 127 140), July 2016, scale bar: 10 micrometres (= 1/100th of a millimetre). The top illustration shows Brachysira brebissonii from the same location. Photographs by Lydia King. Lange-Bertalot, H. & Moser, G. (1994). Brachysira. Monographie der Gattung. Bibliotheca Diatomologica 29: 1-212. Urbánková, P., Scharfen, V. & Kulichová, J. (2016). 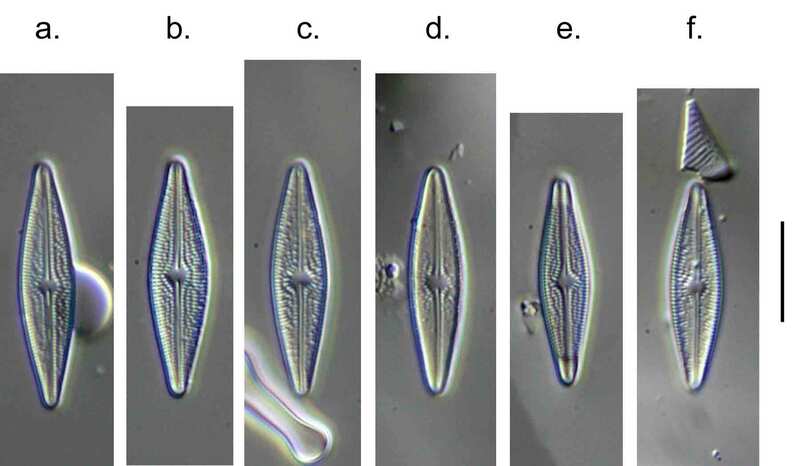 Molecular and automated identification of the diatom genus Frustulia in northern Europe. Diatom Research 31: 217-229. Van der Vijver, B. (2014). 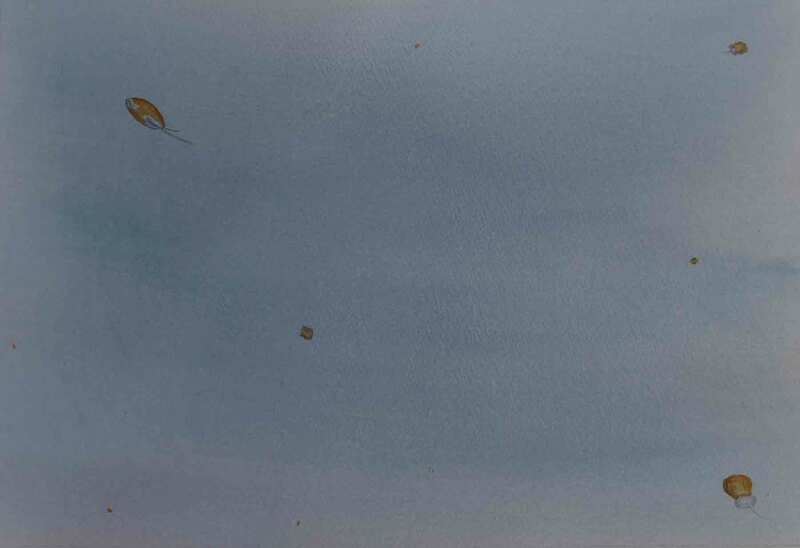 Analysis of the type material of Navicula brachysira Brébisson with the description of Brachysira sandrae, a new raphid diatom (Bacillariophyceae) from Iles Kerguelen (TAAF, sub-Antarctica, southern Indian Ocean). Phytotaxa 184: 139-147. Veselá, Urbánková, P.,Černá, K. & Neustupa, J. (2012). Ecological variation within traditional diatom morphospecies: diversity of Frustulia rhomboides sensu lato (Bacillariophyceae) in European freshwater habitats. Phycologia 51: 552-561. In an earlier post about diatoms from this location (see “Reflections from Ennerdale’s far side …”) I showed some images of live cells of Stenopterobia sigmatella but added a comment to say that there was a very similar species, S. densestriata, that I could not rule out on the basis of observations of live cells alone. I now have had the opportunity to have a looked at cleaned material as well and can confirm that the population in Ennerdale Water is, indeed, S. sigmatella. S. sigmatella has less than 24 striae in 10 micrometres whilst S. densestriata, as the name suggests, has more (> 26 / 10 micrometres). S. densestriata is also shorter (< 110 micrometres) and narrows to more acutely-rounded ends. We also found a few valve of S. delicatissima, the other member of the genus that has been recorded from the UK. Stenopterobia spp. from Ennerdale Water, July 2016. i.: part of a cleaned valve of S. sigmatella; j. S. delicatissima. Scale bar: 10 micrometres (= 100th of a millimetre). Photographs by Lydia King.